Divided lives: the public and private struggles of three accomplished women. · One Book. One Author. One Hour. Divided lives: the public and private struggles of three accomplished women. Notes on front endpaper: 230 p.m. Who did you write this book for. Howard Stringer p 202-Jennifer Patterson. Underlinings/Notes: Underlinings: Lamb underlines information about Walsh's subjects, the challenges of their interviews, emotion, relationships of subjects to work, job frustrations. Notes: 1. her job; 2. her relationship with a man; 3. " " " her children," "tears," "Russia," "Hewitt," "teleprompter," "Nov. 25, 1989 married," "N.Y. Times," "crying," "babies," "Senator Jay," "Italy," "crying," "dress," "tattoo," "Sharon R.," "L.T. Anderson," "Feb. 93'," "salary," "Stringer gave no. of labor lawyer," "perfect surgery," "tears," "children," "my meeting May 92'," "frazzled," "$500,000," "reason." 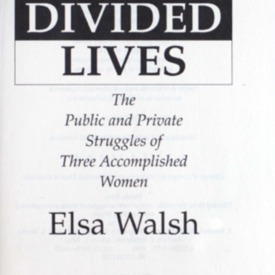 Walsh, Elsa, “Divided lives: the public and private struggles of three accomplished women.,” One Book. One Author. One Hour., accessed April 24, 2019, http://booknotes.gmu.edu/items/show/714. An intimate look at the lives of three contemporary women--television journalist Meredith Vieira, conductor Rachael Worby, and breast surgeon Dr. Alison Estabrook--portrays their conflicts as they struggle to balance their own needs with the needs of those around them.